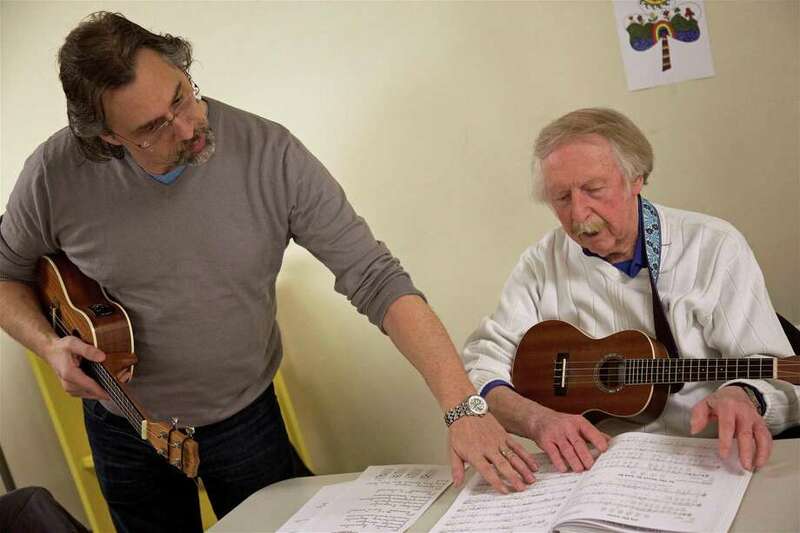 Facilitator Steve Forlano talks music with Ben Wilson of Norwalk at the Ukulele Meet Up at The Westport Library on Thursday, March 21, 2019, in Westport, Conn.
WESTPORT — For four years now the monthly Ukulele Meet Up at The Westport Library has been giving people something to sing — and strum — about. “I have to say it’s been really amazing,” said Deborah White, the children’s librarian who conceived of the idea to provide a place for experienced and novice ukulele players to share the joys of music and, in the process, learn a little about the instrument. “I’ve got now a mailing list of between 100 and 150 people who over the past four years have come,” she said, with generally eight to 15 people showing up each month on third Thursday at 7 p.m.
White, who even motivated the library to get a pair of ukuleles available for borrowing, encouraging everyone to come and try it, regardless of how much experience they have.